Smircks and Sneers, Sticks and Stones, Word and Deeds. | "Northern Crossings"
So a wandering Native American rent a protester who happens to be a Viet Nam Vet just wanders into a crowd of white kids waiting for a bus who seem to be acting disrespectfully to a group of black folks who just happen to be screaming at the top of their lungs a long list of obscenities against not only the white kids but LGBTQ folks as well. At least that is what I could hear on the long version of the tapes that are out there. I would have thought that that alone would make them, the black protesters criminals, but not in this kind of environment of “let’s find the rascist”. The fact the Covington School kids were attending a prolife rally and were wearing MAGA hats made them targets. Nathan Phillips the peripatetic drum beater can be found at most protests and of course felt disrespected because he believed that he was being “blocked” from exiting what ever he was trying to exit and so he just stood there and drummed and sang. He does not explain why he approached that particular area since the mall is a big place and why he happened to approach this particular group. Of course no one mentioned the obscenity laced violent language of the other group in the middle of this and that is the Black Hebrew Israelites. 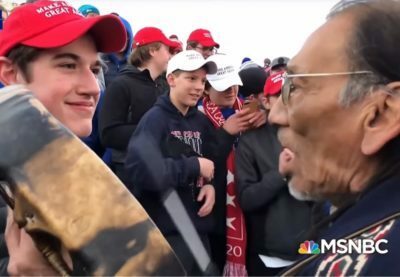 The Covington boys were said to be chanting “hateful things” according to the press who of course are the arbiters of decency, but the most I can hear is some school sports cheer chants which I always thought purely from a taste perspective were obscene by definition. To show the absurdity of this whole thing one of the boys defenders, when asked if he heard them shouting obscenities said, “no I never heard them shouting “build the wall” or anything like that. Who decided that those three words out of all the other words uttered that day are obscene? There is more to the story of course. After a while a lot of people have looked at a lot of video and have come to the conclusion that the Covington Boys are more abused than abusers. Being white and at a prolife rally and wearing a MAGA hat can be in the atmosphere in which we live a reason for the death sentence. And the threats are out there, The Covington cowards that threw their own kids under the bus might want to think about what they can do to protect them in the near future and what happens if one of them is hurt or worse? There might be a safe haven under a bus but one can’t stay there forever. The school and the diocese may find comfort in trying to placate all the crazy’s out there by chastising innocent children but then they should not be attending life rallies anymore. Protesting the death of innocent children is not noble if you are willing to allow the brutalization of your own children that you are in charge of, in order to not offend the permanently offended. Well the Covington School is closed today, bomb threats you know. I hope the diocese officials and the administrators at the school enjoy their shut down. It may last awhile. Protestors will arrive and they can stay awhile because they get paid more than government unessential workers do. George Soros money goes a long way even though Ocasio Cortez says his very existence as a billionaire is an obscenity. The definition of obscenity is fungible. Antifa plans to come and protest at the campus and then we might get some video of real disrespect and real hatred, but the press has to cover it for us poor benighted saps out here in the boondocks to actually see it, Instead we get the still picture of the Covington boy smiling in the face of a pounding drum. I guess I have to take that back. The fake press getting some backlash itself has had to back off on the most egregious accusations against the boys. What I heard last night is that they appeared to be disrespectful and the boys smile looked more like a smirk. PreviousExtravagant Grace and Frustrating Phones – the Rest of the Story.